The Institute for the Desert Arabian Horse has announced the top ten winners in its Drinkers of the Wind Performance Award Program for 2009. “Horses from throughout the US and Canada are attracted to this program because it recognizes achievement in a wide variety of performance disciplines, demonstrating the versatility of the Desert Arabian Horse,” said Anita Enander, Chairman of the Institute for the Desert Arabian Horse. “These horses represent the best characteristics of the Bedouin Arabian horse: nobility, character, strength, and willingness to perform. It is particularly noteworthy that most are trained and ridden by their owners. 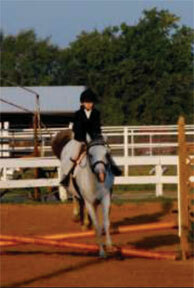 AHA Region 11 Sport Horse Championships. Khehanad Adhem++//, ridden by Lance Bowman. Copyright Avalon Photography. Use by permission from Lance Bowman. High point award winner for 2009 is Khehanad Adhem++//, 1999 stallion (Khe Adhm x Sahanade). In addition to multiple Region 11 and 14 championships, he was three-time National Reserve Champion in Second-Level Dressage AAOTR, First-Level AAOTR, and First Level ATR. He garnered additional National Top Tens in both First- and Second-Level Championships and in Second-Level ATR. 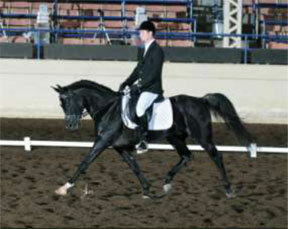 He gained his Legion of Merit and Legion of Excellence awards from AHA during the year as well as multiple USDF awards. Khehanad Adhem++// is owned and ridden by Lance Bowman of Paducah, Kentucky. The perpetual trophy awarded to the top horse comes from the estate of Walter Schimanski. Lance will also receive a cash prize donated by Hansi Heck-Melnyk, long-time owner of Serenity Farms and a strong advocate for demonstrating the performance abilities of the Desert Arabian horse. Reserve winner is the mare OT Dytu RSI (Drkumo RSI x Dytatu RSI), who completed 29 American Endurance Ride Conference (AERC) rides for a total of 1485 miles. “Tu” routinely competes in multi-day 50-mile rides. She placed first at the Eastern Mojave Scenic Pioneer. During the 4-day Grand Canyon Pioneer XP she was first on two days and was Best Condition on another day of the same ride. OT Dytu RSI was bred, trained, and ridden by Crockett Dumas, of Escalante, Utah, who competes in the heavyweight division. Tu won the top Drinkers of the Wind award in 2008. She is also the only mare to achieve top 10 in 2009. The Drinkers of the Wind competition is open to horses presumed to descend entirely from Bedouin-bred horses. All horses marked in the AHA DataSource as being Pyramid Society Straight Egyptian and/or Al Khamsa horses in North America are eligible to compete. The Institute also recognized top ten among horses that competed in local, community, 4-H, and other shows in less traditional events. Top point horse in this category for 2009 is TreffHavenAlizeer, a 1997 Straight Egyptian gelding that competes in trail, walk-trot maiden, equitation, pairs, and Western equitation. Owner Chris Bode lives in Plano Texas and has done all of Ali’s training for the last three years. The pair was the Tiki Trail Champion for 2009 at the Susar Farm Open Horse Show series and won that honor competing against over 100 horses! For further information about the Drinkers of the Wind award program, contact Susan Mayo, competition secretary ( ) and member of the Institute Board of Directors. Participation is free.